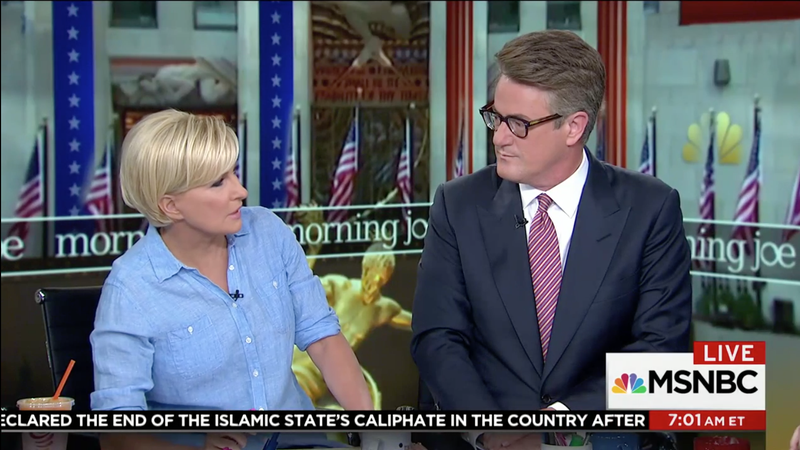 Morning Joe hosts Mika Brzezinski and Joe Scarborough have responded to Donald Trump’s most recent Twitter attack, in which the President of the United States and noted misogynist called Brzezinski “low I.Q. Crazy Mika” and said that when he saw her at New Year’s “she was bleeding badly from a face-lift” after she mocked his eminently mockable fake Time magazine cover. “We ignored their desperate pleas,” they wrote. Delaying their Fourth of July vacation, the pair also appeared on their MSNBC program Friday morning and went into more detail about Trump’s behavior and their concerns about his mental health. And for some reason, we’ve seen this time and time again with Mika. I will insult him over the Muslim ban, or say that he’s a racist, I’ll say he’s a racist with what he said about David Duke. All of these things through the year. And for some reason, he always goes after Mika, and it’s always personal with Mika. And he packed about five lies into the tweets, which, very productive two tweets-to pack five or six lies into two tweets. But yesterday was just another example of just how deeply personal he is. He attacks women because he fears women. He appears to have a fragile, impetuous, childlike ego that we’ve seen over and over again, especially with women. It’s like he can’t take it. And I saw this happening yesterday in real time...I knew, in real time, that the president would be tweaked by that. And I wondered, oh boy, feel there’s going to be a response. And I’ll tell you that—think about it. It is unbelievably alarming that this president is so easily played. He is so easily played by a cable news host. Now what is that saying to our allies? What is that saying to our enemies? We have friends inside the White House that have told us over the past month they’re getting more concerned about his emotional state and also more concerned over time about what’s happening across the world. There are bad things brewing across the world...This is one of the most dangerous times in recent American history and we have a president who is attacking a cable news host because she dared make a joke about a Time Magazine news cover. The most devastating thing, though, is that nothing Brzezinski or Scarborough shared was something the world (or even just the two of them, despite their complex relationship with him) didn’t know about Trump even a year ago when he was one of 16 flailing presidential candidates—and the GOP, cable news, and large swaths of the American public laid down the red carpet for him anyway.